A JOURNALIST IN PRINT, AUDIO AND VIDEO. DESCENDED FROM A LONG LINE OF STORYTELLERS. DRIVEN BY LOVE FOR NATURE. OSSIE MICHELIN: JOURNALIST IN PRINT, AUDIO AND VIDEO. I am a freelance journalist working in print, audio, and video. 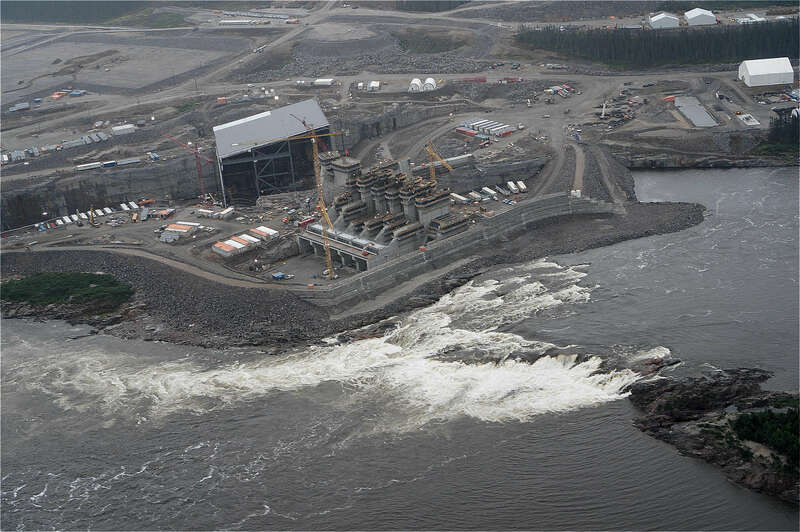 My name is Ossie Michelin and I am a freelance journalist from North West River, Labrador. I come from a long line of storytellers, and I continue this tradition in my own way. The focus of my journalism is northern and Indigenous issues. My mother first came to Labrador in the 1970s working as a nurse with the Grenfell Mission in my hometown; there she met my father, a local Inuit trapper. The two fell in love and a few years later, they got married and I came along! I grew up with my family going off on the Land, hunting, trapping, fishing, and berry picking. I spent much of my youth in traditional Labrador canvas tents with spruce bow floors and in tiny cabins off in the woods. My heritage and upbringing instilled in me a lifelong love of the natural world and especially of the Labrador environment. Admittedly, while I spent my early years more interested with what was online and on television than with hunting and fishing, I have always loved Labrador. Now I am trying to relearn these traditions, and enjoy my Land and culture with a whole new perspective; through my photography, writing, and video work. My origins: a cultural crossroads. Labrador is where North meets East, and you can see it in almost every aspects of our lives; from our songs of the sea and snow, to the blending of Indigenous and European family names, to our distinct accent that isn’t quite Newfoundland and isn’t quite Iqaluit, to our very DNA. Labrador has always been at the crossroads of people with Innu, Inuit, British doctors and nurses, European fighter pilots, American explorers and archeologists, Newfoundland fishers, Basque whalers, German Missionaries, French Fur traders, and of course the blend of people that are the result of this centuries of mixing. I am not from the province of Newfoundland, but from Newfoundland and Labrador, and I happen to be from the mainland of the province. For those of you joining us from Quebec, we’re that big bite taken out of the corner of the Quebec-Labrador Peninsula. "THE THING I AM MOST PROUD TO BE IS A LABRADORIAN." I, myself, am a lot of things: a journalist, a geek, queer, an Indigenous person, but the thing I am most proud to be is a Labradorian. My connection to my Land, to my ancestry, to my family, and culture steer me in my everyday life in ways I do not understand. I just know that I am proud and thankful for my home, and that wherever I may travel in this world I have a place to heal, a place to reconnect and recharge. It also doesn’t hurt that I’m from one of the most beautiful places in the world. The picture above was taken from my backyard. I was watching TV or something; I looked out and saw a beautiful sunset so I just snapped it. See my Little Lake gallery for more. After graduating from Concordia University in Montreal with a BA in Journalism, I worked for five years with the Aboriginal Peoples Television Network. 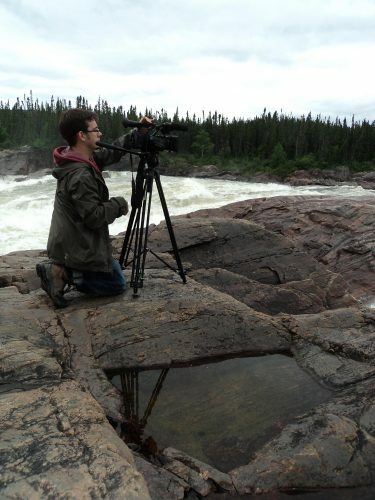 I was a video journalist in both the Montreal bureau and Atlantic bureau (based in Halifax), and helped APTN establish its first home-based bureau in Labrador. I had originally become a journalist with the idea of helping more people understand my home of Labrador. While working for APTN I traveled across all across Eastern Canada; from Ottawa to Attawapiskat, to Natuashish, to Elsipogtog, to Inukjuaq. I learned how Indigenous people live across the country, whether it was in lager urban centres or in isolated fly-in communities. Meeting Indigenous people doing so many important things changed my perspective of the world, and of Canada. A notable chapter of my work has been done in 2013 while working for APTN, covering the Elsipogtog First Nation’s battle against fracking. A picture I took of Amanda Polchies before a line of riot police in Rexton, NB went viral. The photo has inspired paintings, prints, and countless memes; it has appeared in books and magazines around the world. 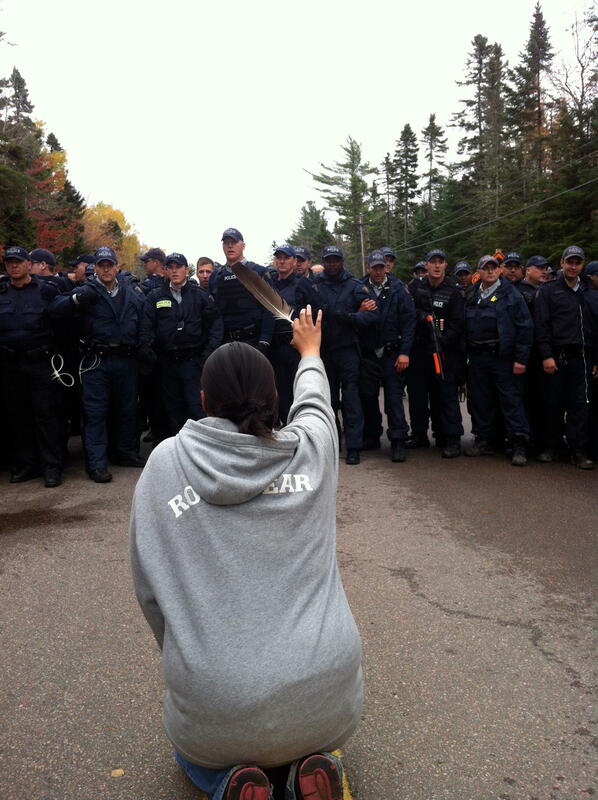 The photo has gone on to be a symbol of Indigenous resistance and the power and grace of indigenous women. The Huffington post has named it as one of the defining pictures of Canada in the 21st Century, and Indian Country Today called it “the feather heard around the world.” The picture has been printed in textbooks and magazines, has appeared in countless blogs and news websites, and has toured galleries across Canada. I met many people during the months I was covering the anti-fracking demonstrations and barricade, and I remember them fondly. Covering the anti-fracking demonstrations and police crackdown was memorable to say the least, it was sometimes hard. When winter came and the blockades were all over, I needed to go home to Labrador. 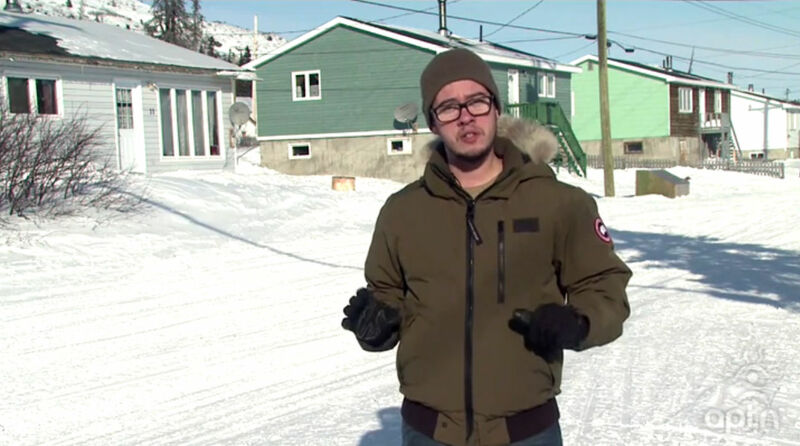 So I opened APTN’s first home-based bureau and covered news stories across Labrador for APTN National News. During that time I covered weekly Indigenous news happening across Labrador. After finishing with APTN I worked as a freelance journalist and on a number of projects with the Nunatsiavut Government in Labrador. With time to focus on personal projects I took the opportunity to work with youth in a number of Labrador communities, making Inuit youth-focused anti-smoking videos, and working with a children’s theatre festival. During this period I focused on print journalism, writing articles for Labrador Life Magazine, Newfoundland Quarterly, Inuit Art Quarterly, Atlantic Business Magazine, Ricochet Media, and more. "LIVING BETWEEN NORTH WEST RIVER AND MONTREAL..."
Currently, I am living between my home of North West River and Montreal. I go back and forth by road and air several times a year. I now work as the Knowledge Mobilization Coordinator for the Tradition & Transition research partnership between Memorial University and the Nunatsiavut Government. The partnership creates Inuit-led community projects that will have lasting benefits for the Labrador Inuit, from children’s books in Labrador Inuktitut, to projects that allow Inuit communities to celebrate female leadership, to community-led archeology projects.